International Music Festival "Faces of Friends" came to X edition. For the tenth time Cahul is comprised of the Festival fever between 26-28 June. At the Jubilee edition will evolve: Zdob si Zdub, Dan Balan, Natalia Barbu, Olia Tira & Alex Calancea Band, Todo, Unbreakable, NDS, Single Pointe, Mate and others. 15 participants in the contest, 7 members of the jury, about 100 artists at the festival scene, supporters, parents, composers, producers and journalists a true VIP battalion, "exiled" for 3 days in the capital of the South. 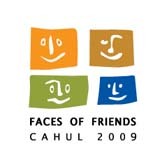 According to the "Faces of Friends" Festival contest rules on the first day of the contest participants play a song in the native language, in the past editions have been interpreted songs in Romanian, Ukrainian, Russian, Georgian, Armenian and Belarusian. On the second day, contestants sing a piece of the international repertoire. The specific of this festival is that the judging process is made open, meaning that it takes place immediately after the performance of all the participants. Thus each can see the "quality" of his performance, and also that of competitors. Among the artists and bands that evolved on the festival stages are: "Zdob si Zdub", "O-Zone," "Nest," "In Quadro”, “Trigon”, Nelly Ciobanu, Sergey Izba?, Tatiana Boeva, Torstein Sodal , Ruslan Taranu, Valeriu Gaina, “Edict”, Cezara and many other artists. A separate event in the festival is the jazz night, which takes place on the second day of the contest, immediately after the concert in the Independence Square in Cahul, when the winners are known and the totals are made. On the night of jazz all the participants, supporters and members of the jury are invited, where a small party with beer and grilled meat will be held. At this party, everyone will be able perform on an already prepared stage, without being bound by any circumstances. Since jazz requires improvisation, we can firmly say that each of those on stage is an "ace" in the field.